After 20 years of service, Dan Withers decide it was time to retire from the Coast Guard and separate from the military. “Moving every three years in the Coast Guard is exhausting. We never found a place that we could call home,” Withers explained. Most recently, Withers lived in Key West with his wife, daughter and family dog. It was an ideal place. Then Hurricane Erma hit in the summer of 2017. After the hurricane, the family sat down and began talking about life outside the military. “Key West was decimated by the hurricane. We had a family conversation, and we decided it was time for me to retire,” he said. Withers was looking for something that he would enjoy doing. As a member of the service, he’s passionate about the mission of his work. That’s why he applied at Sweetwater when he retired, and Sweetwater only. He believed in the company and its mission. “Sweetwater has a great story. They are as transparent and efficient as you can be as a company. Coming from the federal government side, that’s what I was looking for,” he said. Withers, a musician, was a customer of Sweetwater for a number of years. “I’ve always had really excellent interactions with everyone at Sweetwater. My sales engineer was not like the typical sales guy. He didn’t try to oversell me. I completely trusted him. I thought to myself if he can do this job, so can I,” he said. 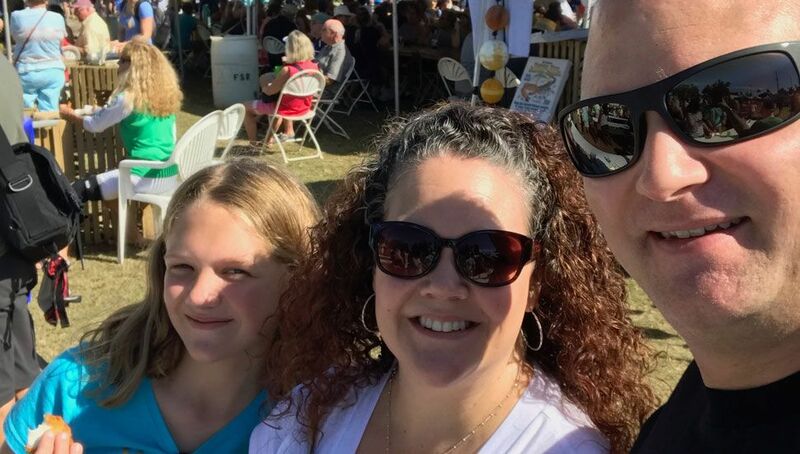 After years of moving around the country, living on the West Coast and the East Coast, the family became Hoosiers in July 2018 so Withers could work for Sweetwater. Immediately, Withers and his family loved Fort Wayne for the low cost of living and available housing. But it was also more than that. He found the community welcoming and supportive. That’s when Withers met Joe Wasson. Wasson is the veteran service officer in Allen County, and he’s the first person veterans speak to when trying to navigate the labyrinth of benefits offered to service members. When Withers moved to Fort Wayne, he connected with Wasson to understand what benefits Indiana offers to veterans. Wasson also has a military background, an Operation Iraqi Freedom Army veteran. When his service was over, Wasson knew he wanted to return to his hometown of Fort Wayne. He said the supportive, military-friendly community made that an easy decision. Wasson serves on the board for the Northeast Indiana Base Community Council (NIBCC). He was part of the team that launched a new website, www.HoosierHomeBase.com. The Northeast Indiana Regional Partnership, in collaboration with the NIBCC and the Indiana Economic Development Association Foundation, launched www.HoosierHomeBase.com as a digital, military-friendly website welcoming veterans to Northeast Indiana by showcasing job opportunities and quality of life in the region. It also provides direct support services to connect veterans with the community and other service members already living in the region, through a program called the “Buddy Program.” The Buddy Program puts veterans in touch with local veterans, job placement specialists and other people in the region’s network of veteran’s affairs experts. Between 100,000-200,000 service members exit the military each year. Historic trends show that about 33 percent of these service members will stay in the community surrounding the base where they were stationed, and another 33 percent will return to their hometowns. This leaves the final 33 percent who are willing to relocate to another community for the right job opportunity. For Northeast Indiana, that equates to over 25,000 veterans annually who are looking for an opportunity to put their skills to work. Regional employers have the jobs for those separating, too, with more than 6,000 jobs posted on the Northeast Indiana Jobs Portal. When veterans transition out of the military, Wasson said it’s critical to have a network of resources. So, when Wasson met Withers, they immediately connected about their service and the challenges veterans face when leaving the service. Separating from the military is different for each person, and it’s unlike any civilian job transfer and move. Now, only a few months after buying their home without seeing it due to Fort Wayne’s nationally ranked hot real estate market, the Withers family is settling in their new hometown. “We’ve found exactly what we wanted here, and we are not going anywhere,” Withers said. To learn more about resources, benefits and programs that support veterans and their families in Northeast Indiana, visit www.HoosierHomeBase.com.